↑ ୧.୦ ୧.୧ Murray, Lorraine. "Christ the Redeemer (last updated 13 January 2014)". Encyclopædia Britannica. Retrieved July 11, 2014. ↑ Giumbelli, Emerson (2014). Símbolos Religiosos em Controvérsia (in ପର୍ତ୍ତୁଗୀଜ୍‌). São Paulo. 244. ISBN 978-85-7816-137-8. ↑ "The New Seven Wonders of the World". Hindustan Times. July 8, 2007. Archived from the original on September 30, 2007. Retrieved July 11, 2007. ↑ ୪.୦ ୪.୧ "Christ the Redeemer". TIME. October 26, 1931. Retrieved July 11, 2007. ↑ ୫.୦ ୫.୧ ୫.୨ "Brazil: Crocovado mountain – Statue of Christ". Travel Channel. Archived from the original on May 16, 2007. Retrieved July 7, 2007. ↑ ୬.୦ ୬.୧ ୬.୨ "Sanctuary Status for Rio landmark". BBC News. October 13, 2006. Retrieved July 7, 2007. ↑ "Cristo Corcovado by Sergi Lla on Prezi". Prezi.com. Retrieved October 15, 2015. ↑ Phil, Damon (June 29, 1983). "Vote now for Phoneheng". The Sun. London. ↑ Dima, Alina. "Gheorghe Leonida – Romanian contribution to "Cristo Redentor"". ↑ "Vandals cover Rio's Christ statue with graffiti". Reuters. April 16, 2010. ↑ Tabak, Bernardo. "Estátua do Cristo Redentor é alvo de pichação". Globo. ↑ Infosur hoy: Christ the Redeemer to get new outfit Archived July 14, 2014, at the Wayback Machine. ↑ "Cristo Redentor vai passar por restauração até junho ("Christ the Redeemer under restoration 'til June")". Estadão. ↑ Moratelli, Valmir. "Cristo Redentor, castigado por raios, passa por ampla reforma (Christ the Redeemer, punished by lightnings, go by ample refit)". Último Segundo. ↑ "Lightning breaks finger off Rio's Christ". The Age. January 2014. ↑ "Climbing Christ the Redeemer youtube video". Ontheroofs. December 10, 2015. ↑ "Climbing Christ the Redeemer ontheroofs story with photos and video". Ontheroofs. December 10, 2015. Archived from the original on September 21, 2016. ↑ Millward, David (December 12, 2015). "Watch the stunning footage taken by photographers who climbed Rio's 125-feet tall Christ the Redeemer Statue". The Telegraph. Archived from the original on September 21, 2016. ↑ ୨୩.୦ ୨୩.୧ ୨୩.୨ "Brazil's Christ state returns after renovation". BBC News. July 1, 2010. Retrieved July 1, 2010. ↑ Christ the Redeemer se la come, YouTube video, accessed January 20, 2011. ↑ "Reforma no cartão-postal". 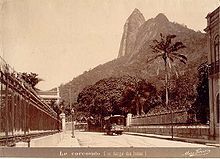 Veja Rio. May 18, 2010. Archived from the original on January 27, 2010. Retrieved May 18, 2010. ↑ Bowater, Donna; Mulvey, Stephen; Misra, Tanvi (March 10, 2014). "Arms wide open". BBC Online. Retrieved December 2, 2014. ↑ Kompas Cyber Media. "Presiden Resmikan Patung Yesus Kristus di Pulau Mansinam – Kompas.com Regional". Regional.kompas.com. Retrieved October 15, 2015. Blanes, Ruy Llera (2014). "Review: Giumbelli, Emerson (2014), Símbolos Religiosos em Controvérsia. São Paulo: Terceiro Nome". Vibrant: Virtual Brazilian Anthropology (in ପର୍ତ୍ତୁଗୀଜ୍‌). 11 (2): 470–472. doi:10.1590/S1809-43412014000200016. ISSN 1809-4341. Archived from the original on December 20, 2010. Giumbelli, Emerson (2008). "A modernidade do Cristo Redentor". Dados (in ପର୍ତ୍ତୁଗୀଜ୍‌). 51 (1): 75–105. doi:10.1590/S0011-52582008000100003. ISSN 0011-5258. Giumbelli, Emerson & Bosisio, Izabella (2010). "A Política de um Monumento: as Muitas Imagens do Cristo Redentor". Debates do NER (in ପର୍ତ୍ତୁଗୀଜ୍‌). 2 (18): 173–192. ISSN 1982-8136. Giumbelli, Emerson (2013). "O Cristo Pichado". Ponto Urbe. Revista do Núcleo de Antropologia Urbana da USP (in ପର୍ତ୍ତୁଗୀଜ୍‌) (12). doi:10.4000/pontourbe.586. ISSN 1981-3341. Ranquetat-Júnior, Cesar Alberto (2012). Laicidade à brasileira: um estudo sobre a controvérsia em torno da presença de símbolos religiosos em espaços públicos (Doutorado em Antropologia Social) (in ପର୍ତ୍ତୁଗୀଜ୍‌). UFRGS. 310 pp. Retrieved December 7, 2015. Ranquetat-Júnior, Cesar Alberto (2015). "Giumbelli, Emerson. Símbolos Religiosos em Controvérsia. São Paulo: Terceiro Nome, 2014". Debates do NER (in ପର୍ତ୍ତୁଗୀଜ୍‌). 1 (27): 429–437. ISSN 1982-8136. Poliakoff, Martyn. "Soapstone @ Cristo Redentor". The Periodic Table of Videos. University of Nottingham.